These insights are particularly important to understand because consumers are now constantly connected, using multiple devices throughout the day. In the next few weeks, this will be even more pronounced as people shop for holiday gifts. A recent holiday study shows that 84% of consumers who are likely to use a mobile or tablet device while shopping this holiday season, will start shopping on one device and finish on another. We’re making it easier for advertisers to understand these consumer behaviors with new insights that are part of Estimated Total Conversions, a new column in AdWords. Estimated Total Conversions includes cross-device conversions, which are also shown in a separate column to highlight their importance. 1. Take another look at your desktop/tablet bid. Once you see more conversions that can be attributed to AdWords, your total ROI from AdWords will change. Re-calculate your desktop/tablet cost-per-acquisition (CPA) based on these cross-device conversions. If your CPA has improved using this measure, you might want to look for opportunities where you may be able to increase position and volume by increasing your bids. 2. Capture the full value of mobile. Many experienced search marketers are already using this data to make business decisions, by starting a test on campaigns that previously did not show on mobile. Within a few weeks of showing ads on mobile devices, these advertisers started to see conversions they could not before -- those that started on a mobile phone and ended on another device. These insights led to important business decisions like adjusting mobile bids or shifting budget to reflect the new ROI of their keywords. Amber Yeray, Digital Marketing Manager at EXPRESS, a national fashion retailer, has been working with her agency partner, RKG, to understand the new insights offered by Estimated Total Conversions. 3. Spend only the most profitable dollar. 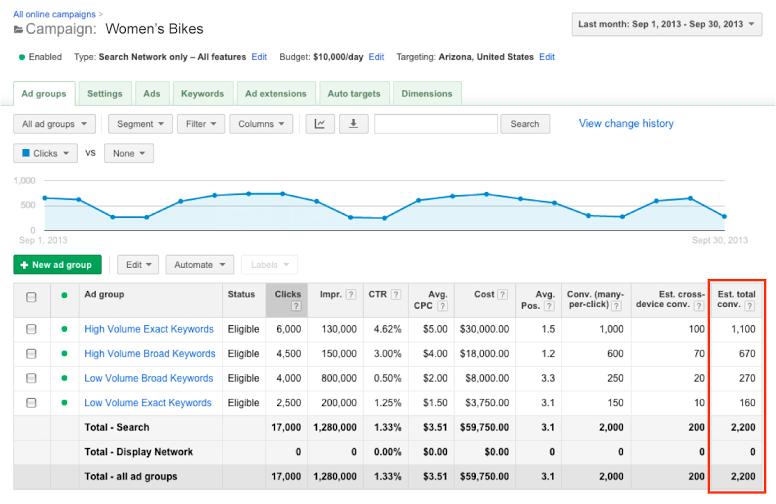 The total value of your AdWords investment might change once you’re able to see more conversions. Whether it’s AdWords, other digital channels or offline media, think about investing your dollar into the most profitable channel possible. Estimated Total Conversions provides new insights that may help you optimize bids and budgets to improve performance. Amit Shah, Vice President of Online, Mobile & Social at 1-800-Flowers, used the new insights that he gained to make more informed budget allocation decisions. These are just a few of the tips that we will continue to share as we hear feedback from you. Check out these best practices along with a walkthrough of Estimated Total Conversions in a recent webinar we hosted.